Notre Dame's Tyler Bourne during the Division I boys basketball quarterfinals between Danbury and Notre Dame-Fairfield at Trumbull High, March 12, 2018. 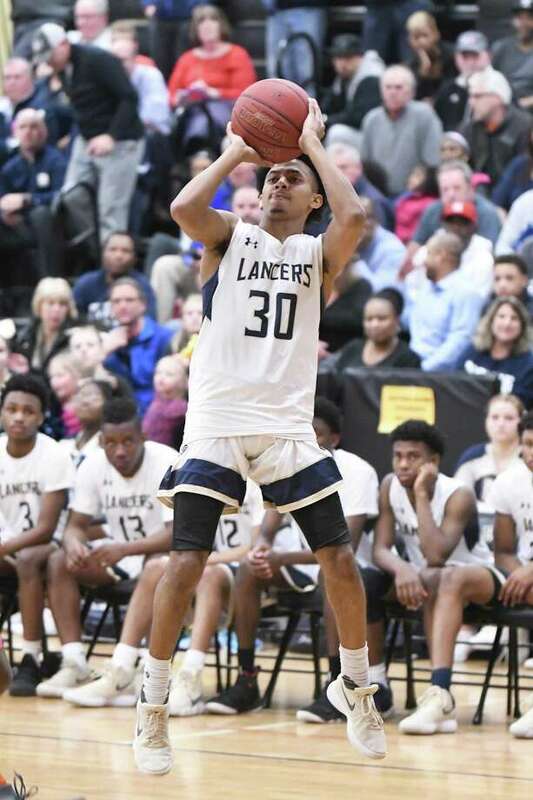 ACCOMPLISHMENT: Scored 30 points, handed out seven assists, grabbed four rebounds and had a steal in the Lancers’ 65-60 win over Sacred Heart-Waterbury that gave them the Division I state championship. It was ND’s first basketball state title. Bourne scored 21 points in the second half. ACCOMPLISHMENT: Scored two goals in the Jesuits 4-2 win over Greenwich in the Division I championship that gave Prep its 14th state title. Oricoli’s first goal tied the game at 1-1 in the first period and his third period goal again tied the game at 2-2.